NEW YORK (CNS) — The publisher Manga Hero specializes in combining two seemingly disparate things: comic books in the Japanese, or manga, style and Catholic subject matter. The imprint’s founder, Jonathan Lin, whose father grew up in Japan, has used this aesthetic — which is known, among other things, for its kinetic energy — to celebrate the lives of St. John Paul II, Pope Benedict XVI and characters from the Old and New Testaments. There is plenty of action in these volumes and the biographies are uniformly well researched. Lin’s writers are all graduates of Catholic colleges. 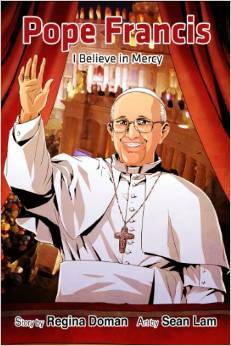 Manga Hero’s newest offering is “Pope Francis: I Believe in Mercy.” It’s a revised and expanded version of a profile of its subject — known as Jorge Bergoglio before his ascent to the papacy — published in 2013. Of course, the comic book form can be used to tell any story. But it’s surprising how well manga works in recounting tales about the church. In a way it shouldn’t be that much of a surprise. After all, Jesus led a life full of action — from his long journeys on foot to his dynamic healings and confrontations with the devil. Predictably, there is nothing morally objectionable in “I Believe in Mercy.” But there is one scene depicting violent unrest in the pope’s homeland of Argentina. While not graphic, this section of the narrative may require some context for young children. Writer Regina Doman and artist Sean Lam effectively connect events in the future pontiff’s life with aspects of the life of Christ. When a young priest is killed by extremists and Father Jorge experiences fear, for example, the next panel shows Jesus raising his hands to calm a mighty wave. There is also a fun section in the back of the book with a map of the Vatican City State and drawings of the various cars used by the pope. There are only two drawbacks to “Pope Francis: I Believe in Mercy”: the volume’s size and its price. The other Manga Hero books are around 300 pages long, and their compact size makes them easy to carry and read on a train or a subway. They also all cost around $10. “I Believe in Mercy” runs to approximately 50 pages yet has a cover price of $14.99. Additionally, it’s oversized, which makes it more awkward to read than previous titles. Some readers may prefer to start with another Manga Hero comic. At 200 pages and priced under $10, “Many Are Called” is a wonderful alternative, based on the parables of Jesus. The graphic biography contains a single scene of gun-related violence. The Catholic News Service classification is A-I — general patronage. Not otherwise rated.